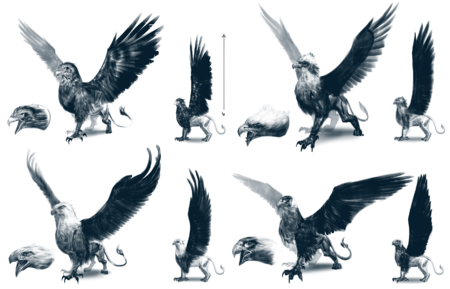 Mount concept art by Jeff Delierre. 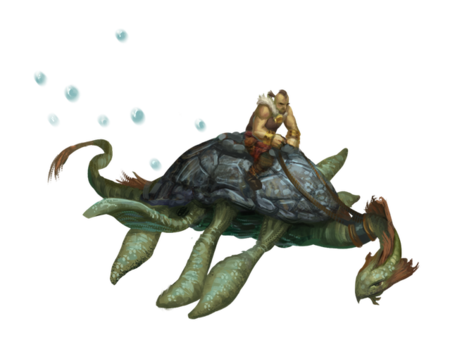 Mounts are obtained through an early quest that is available to players in starting areas. Mounts can also be found in the wild and tamed. Cosmetic skins can be applied to the appearance of mounts that were earned in game. 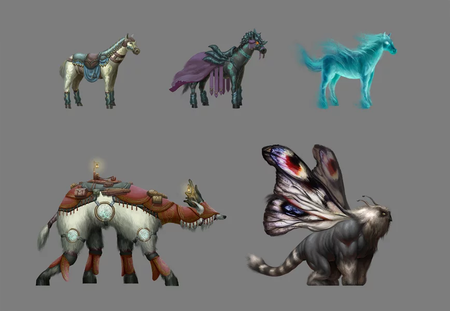 Mounts will be purchasable from players utilizing Animal husbandry and taming. We won't have mounted combat, but we will have mounted abilities. Animal husbandry mounts are summoned via an item that is obtainable from a stable (husbandry stall). De-summoning the mount returns the item back to the player's inventory. 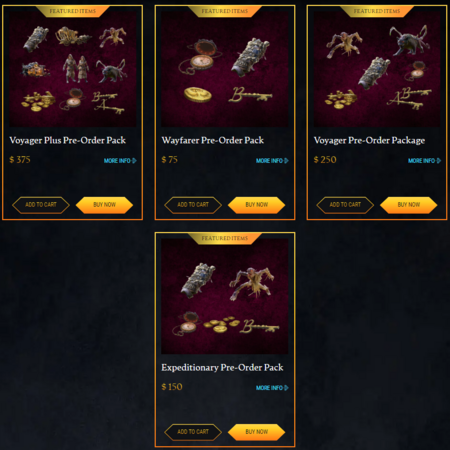 Bonestrider pre-order pack cosmetic item. Land mounts are obtained through an early quest that is available to players in starting areas. 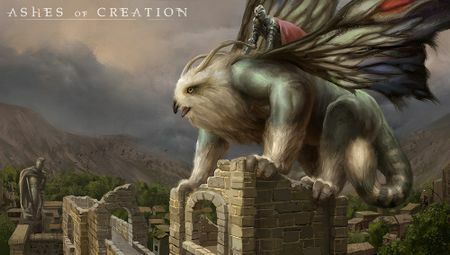 Dawnbreaker gliding mount concept art. Gliding mounts are winged mounts that glide/hover close to the ground. Unlike Dragons, gliding mounts are not capable of true flight. Aquatic mounts are able to be obtained from taming underwater creatures. Runic steed mount concept art by Jeff Delierre. Mounts and pets are able to be named by players. Creatures tamable by Animal husbandry may fit creature templates with pre-defined behaviors. Animal husbandry is a profession within the Processing Artisan class. Animal husbandry will be an exploritative profession. Tamable creatures may fit creature templates with pre-defined behaviors. For example: A wolf or a dog may look different but may be balanced to the same templated behavior. 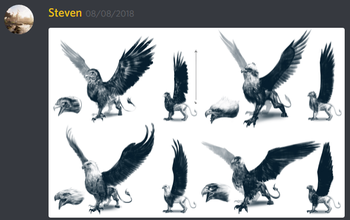 Griffin (griffon, gryphon) concept art. Animal husbandry will have discoverable blends of breeding. Rare creatures can be captured and tamed to breed animals with specific traits. Pets, Mounts and Livestock have unique traits that can be bred. 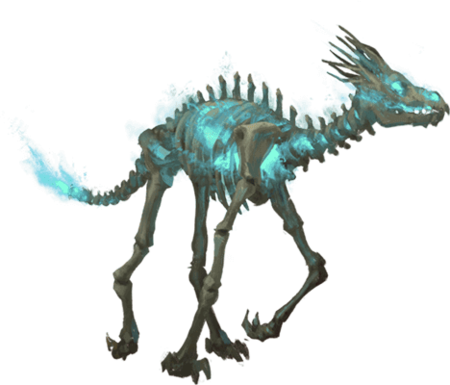 Special mounts such as Dragons are not breedable. 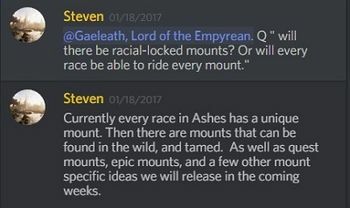 Breeding will change the stats of the mount that is being bred. There is a form of genetics, but it won't be complex. Genetic lines react to the type of mount or creature that has been captured or tamed. Animal husbandry and taming create unique mounts with unique abilities and stats. There are stages of development within breeding. Youngling stage: For mammals this relates to baby animals. For lizards (reptiles) this is an egg stage. A modified character creation system allows customization of Summoner pets and Animal husbandry. Changes at the Youngling stage affect the appearance of the animal at adulthood. During the Youngling stage there may also be quests for specific types of cosmetic features. There is a compendium of acceptable parameters for breeding, which isn't going to be known until players discover it. This discovery may be different for different players. Trial and error and exploration and discovery of certain breeding habits and different quests may grant access to slots in the compendium. 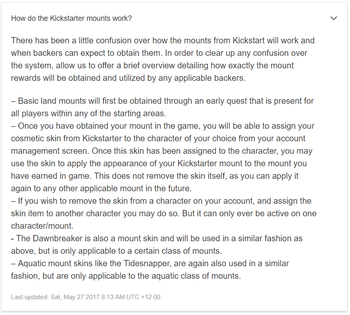 This may grant access to specific types of mounts. Stables of the Oasis pre-order pack cosmetic freehold skin. A type of building for housing mounts. Animal husbandry stalls where mounts can be obtained. Faster travel in Ashes of Creation refers to. Flying automated creatures (Public transportation). ↑ Livestream, 18 January 2018 (34:08). ↑ 4.00 4.01 4.02 4.03 4.04 4.05 4.06 4.07 4.08 4.09 4.10 4.11 4.12 Livestream, 8 April 2018 (PM) (51:49). ↑ 5.0 5.1 5.2 5.3 5.4 5.5 5.6 5.7 5.8 Livestream, 8 April 2018 (AM) (12:34). ↑ Livestream, 24 May 2017 (20:32). ↑ 7.0 7.1 7.2 Livestream, 17 November 2017 (33:17). ↑ 10.0 10.1 Livestream, 26 May 2017 (37:17). ↑ Ashes of Creation Kickstarter - Over 9,500 Backers and Counting!! ↑ 19.0 19.1 Livestream, 5 May 2017 (22:44). ↑ 22.0 22.1 Livestream, 18 January 2018 (33:07). ↑ Livestream, 16 June 2017 (28:07). ↑ 24.0 24.1 Livestream, 1 June 2017 (28:42). ↑ 27.0 27.1 Livestream, 17 August 2018 (12:27). ↑ Livestream, 17 May 2017 (1:04:12). ↑ Livestream, 26 May 2017 (46:43). ↑ Livestream, 9 February 2018 (39:42). ↑ 32.0 32.1 Livestream, 22 May 2017 (53:39). ↑ 33.0 33.1 33.2 33.3 33.4 Podcast, 4 August 2018 (1:22:24). ↑ 34.0 34.1 34.2 34.3 34.4 Podcast, 11 May 2018 (1:02:02). 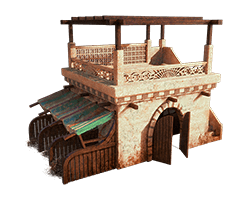 ↑ Ashes of Creation Store: Stables of the Oasis. ↑ 43.0 43.1 Interview, 11 May 2018 (32:36). ↑ 44.0 44.1 44.2 Livestream, 8 April 2018 (PM) (58:29). ↑ 45.0 45.1 45.2 45.3 Interview, 17 August 2018 (24:48).